From conception, parents begin to imagine what their new baby will belike, how they will look and what they will become. Will they be successful? Athletic? Smart? 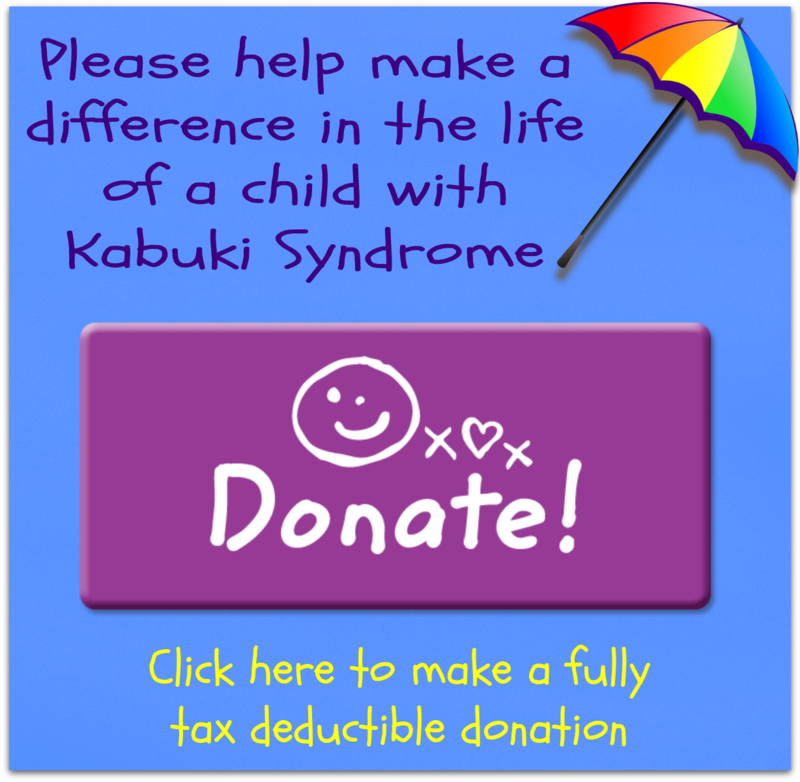 Now when a child is born with a syndrome or a disability our hopes and dreams may change. The rare opportunity of having a Kabuki baby gives us even more to wonder about, however, quality of life seems to take precedence. Elliot was one of the first babies diagnosed with Kabuki Makeup Syndrome in 1990 so we had noone to lead us or a path to follow. With several hurdles to overcome we put aside thoughts of hisfuture and just lived everyday enjoying his life with us. Elliot is now 20 years old and has a future as bright as any one his age. I am honored to offer hisextraordinary life as an example of what is in store for our precious Kabuki Kids. The journey from childhood into adulthood has now been trod by Elliot and others like him so get ready for the awesomejourney. I hope his life experiences will be of help to you as you enter the adolescent rite of passage with your child. Most of us have struggled with medical issues year after year and every hurdle we get over is ablessing. Throughout their lives we celebrate what might have been little to some but are hugeaccomplishments for our kids. Whatever age your child is, now is the time to prepare him/her forthe transition from high school to college. Sound crazy? Well read on and I will explain. Elliot like many Kabuki Kids, had such low muscle tone that he could not eat or drink on his ownat first. I will never forget the call I got one day from the school principal telling me that Elliot blew on a paper windmill and it moved. This accomplishment brought the entire administrative staff to tears. What this did for Elliot was send the message that if he worked long enough at something,no matter how difficult, he could do it. I look back and realize that preparation for the transitionfrom high school to college started from the beginning. When we celebrated the small victories,survived the major surgeries and loved him through the struggles, we were teaching him to justdo it. So the first thing in preparation for post high school education is give him the confidence rightnow to go for whatever he wants, to not treat him/her different but give them the resources to explore their passions and experience success. This will give him confidence. To some it might seem like we are setting him up for failure, but it isn’t. Children, regardless of whether they have a disability or not, know their capabilities and limits. A toddler will not attempt to climb a tree but in time will have the physical ability to do it and will know when he can. A young boy will not attempt a try out for a sport unless he is athletic. A young girl may like to sing but if that is not one of her talents she will look for something she has the skill for. There are amazing programs in the colleges and universities for students with disabilities. The important thing is to look for a program that is adaptive and has a curriculum designed for special students. We found superior programs and centers in the local universities that offered tutoring forthe disabled but did not offer a curriculum. Check with your high school. Many resource programs allow special students the opportunity to continue attending high school after graduation. In our state it is up to 24 years of age. Dependingon your child, it may be beneficial to let him/her stay with the group and environment with whichhe/she is familiar and feels comfortable. You will know when it is time for the transition. While your student is in the third year of high school, begin exploring the resources that are available in your area for children with disabilities that reach the age of majority. Apply for social security or other financial assistance programs that are available in your area. Vocational Rehabilitation programs usually go hand in hand with the financial assistance programs and if they qualify for one they may automatically qualify for the other. Check this out rightaway and apply early. There may be a waiting list. They often pay for the majority of the collegetuition as well.Begin to apply for all the services offered to extraordinary students. Interview the programs in the colleges and take your son/daughter with youIf he/she has an older sibling who is making the transition from high school to college, make it a family event and involve them as much as possible. They will get excited when it gets to be their turn. If he/she doesn’t have an older sibling perhaps you have friends that have an older child making that transition. They probably would be happy to help. Talk about it a lot and listen to your child. They will tell you if they are ready. You can probably tell by their interest and enthusiasm. Take advantage of the resources in your high school. If they have a work experience program, get him/her involved. So many companies hire special kids like ours…they are good workers and gain confidence. High Schools usually hold career fairs at the end of the school year. Attend those events to meetrepresentatives from colleges and social and government programs. The resource or special education department in your high school probably receives brochures and information about special programs throughout the country. It was through the high school where Elliot attended, we discovered the program he now attends at Eastern New Mexico Universityin Roswell. ENMU-R, http://www.roswell.enmu.edu/special_services/index.php is an excellent example of a college that offers specific post education and life training for students with disabilities. The comprehensive community university mission of ENMU-Roswell seeks to maximize the educationaland career opportunities for all students with disabilities. Look for a college that is specific in what it has to offer their special students. Do they have career training that allows students to learn marketable vocational skills with ahigh percentage of employment placements for their graduates? Do they teach independent living and have valuable life experiences with positive personalgrowth? Are the students able to integrate into the university community and do they accommodatestudents with the needed services to fully participate in all programs? Is it a certificate program? If the answer to all of these questions is yes than the transition from high school to college shouldbe an exciting and smooth one. A PDF download of this article is available here.